Managers from Internal Audit are the focus of Internal Audit Strategy. Innovative training contents help you to increase your personal performance and that of your employees. Future-oriented management topics in the context of internal auditing at attractive and easily accessible locations enable you to expand your competencies in a targeted and forward-looking manner. A well thought-out didactic concept with state-of-the-art business school training methods is convincing. The ARC team uses modern media such as tablet PCs for interactive case studies. In this way we increase the learning and retention curve with the help of interactive state-of-the-art business school learning forms. At the same time, you receive efficient and sustainable management documentation. You can use them electronically on any user device immediately after the training. This not only benefits you, but you can also share the latest findings with your employees in the next team meeting. The Audit Research Center | ARC Institute aims to sustainably improve the performance of the audits we support. 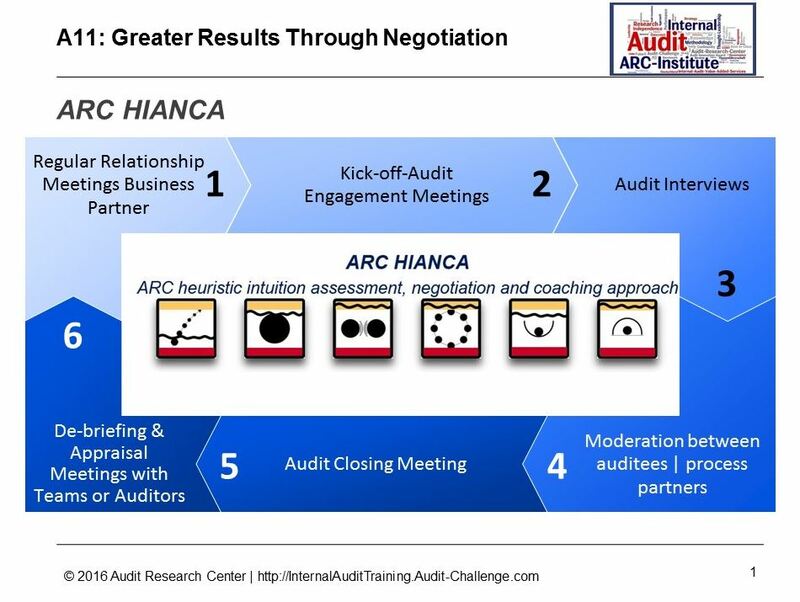 The ARC Institute supports internal audits and their managers in introducing new audit methods and, in essence, in strategic (re)positioning. Our ARC team concentrates on the topics that have a significant influence on the performance of your audit. Read more information about the innovative didactic learning concept here. Read the detailed profiles of the senior management trainers here. Read more about our innovative pricing model here. The Audit Research Center | ARC-Institute is the leading strategic think tank for internal audit in the three German-speaking countries of Germany, Austria and Switzerland and in the European banking sector. We focus on the issues that have a significant leverage effect on the performance of your audit. Our aim is to sustainably improve the performance of the audits we support. With high demands on us and our work, we address critical questions and point out solutions. Together with our customers, we shape the future by opening up new opportunities, tackling and mastering critical challenges while taking into account the various stakeholder demands. With the Audit Research Center, the ARC Institute provides important impulses for the further development of the audit industry. The focus is on the networking between methodology and practice. The focus is on further and new development in cooperation with auditors, companies and associations in order to develop practical and implementable methods, tools and concepts. The results developed in dialogue with industry experts serve as a guideline and adaptation options in practice today, in order to increase the overall benefit of the company in the long term and sustainably with innovative auditing work. In the sense of the thought leadership idea, the ARC Institute stands for topic leadership and forward thinking in the area of internal audit. Currently, the ARC Institute supports not only leading supranational institutions, such as central banks, but also numerous listed companies in the three German-speaking countries of Germany, Austria and Switzerland, as well as in Europe, within the scope of consulting and personnel development projects. Business models are changing in the context of digitization and the development of artificial intelligence. If the (working) world is digital or becomes even stronger, what will the workplace of the revision look like in the future? What qualifications does an auditor need? And how can we maintain or expand our knowledge with short half-lives? In today’s complex international business environment, auditors must successfully overcome two major communication challenges: Maximizing cooperation with audit clients AND navigating between Audit’s position and the audit client’s position on audit findings and recommendations. This workshop aims at improving negotiation skills, persuading, and building relationships entirely from an audit point of view. The foundations of professionalism, the audit process, and the nature of audit findings will all be addressed. 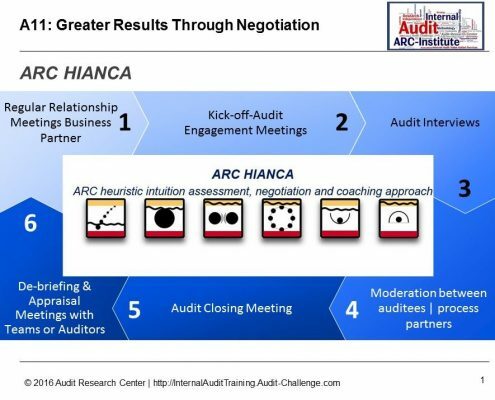 Tactics, techniques and language to optimize cooperation, deal with difficult audit clients, and overcome resistance to findings and recommendations will contribute to the auditor’s future success in interviews, closing meetings and findings resolution.